As a matter of fact I know nothing about opera other than what I seen on TV and what my parents told me as a child. I can name who I know on one hand, Marian Anderson, Leontyne Price, Kathleen Battle and Luciano Pavarotti. I’m not an opera hater, quite the contrary, I recall “fake opera singing” quite a bit as a child. I just never carried any enthusiasm for it into adulthood until now early one Sunday I watched with bleary eyes a community program on TV People to People which did a segment on a local opera production called LaRoche by Americolor Opera Alliance. 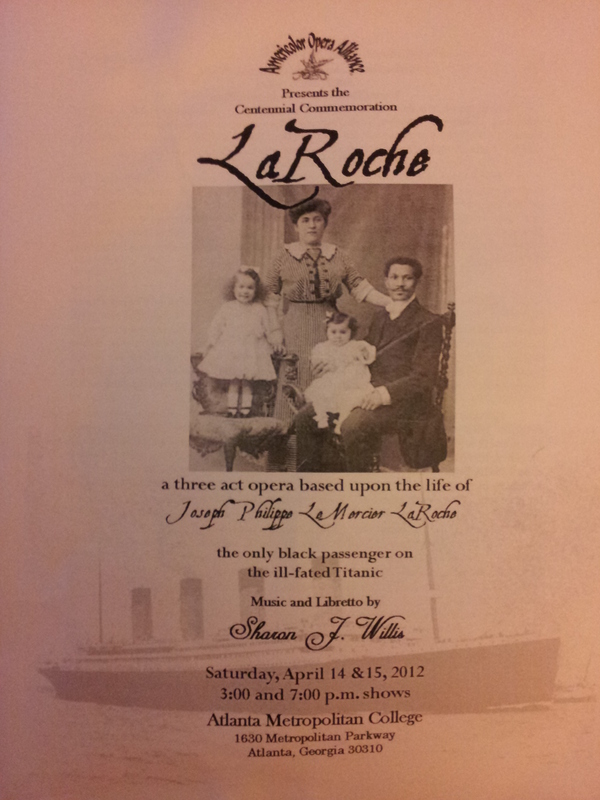 The story was compelling, centered around Joseph Philippe Le Mercier LaRoche, the only black passenger on the Titanic. I called up my always game for something new girlfriend and we set out for LaRoche. The performance was held at Atlanta Metropolitan College in a classroom. The set was minimal with the chamber (musicians) seated diagonally from the state. The stage was soon lit up upon the arrival of the performers, who in the first scene of Act I were in a Haitian marketplace. Timothy Harper, tenor – President La Conte, Mr. Futrelle, Father Byles. There was no raised seating in the room and I was seated behind some fairly tall people. When I heard his voice, I had to stand up and see from whom that sound was coming. His voice was really moving. Marlyssa Brooks-Alt, soprano – Juliette LaFargue LaRoche. The clarity and strength of her voice was the perfect vehicle to portray the heartache Juliette must have felt as she first separated from her father to go back to Haiti with her husband, and when she separated from Joseph who went down with the ship. Wendel Stephens, bass – Joseph LaRoche. Stephens voice was surprisingly beautiful. Not because I had an expectation that he couldn’t sing, but surprising because his voice had “boom”. I guess I expect a big guy to sound like that, yet he was a really average sized guy who produced a really big vocal which was fitting as the lead of the production. This wasn’t all opera as it had elements of a stage play, parts of which were absolutely hilarious. The farewell dinner with the back and forth between the LaRoche servants as they mocked Madame LaRoche (Joseph’s mother) was dead on and Madame LaRoche had the aristocratic demeanor down pat. There was also a funny scene (if you can imagine) as the Titanic was going down between two drunken card players, who continued to “drink to that” as though the fun they were having at that moment was all that mattered. LaRoche was a perfect first timer’s Opera. The founder and director of Americolor Opera Alliance, Sharon J. Willis has done a masterful job at bringing opera to the masses in a palatable form, while telling a compelling story. That the company is primarily made up of persons of color made it all the more worthwhile for this first timer and has even piqued my interest to go hear more. What I’d like to see happen with the Alliance is growth and that growth can happen through sponsorship. As such if you’d like to know more about Americolor or become a sponsor, please visit their website. or when the subject is too dark or too far away, like the moon. Whew! 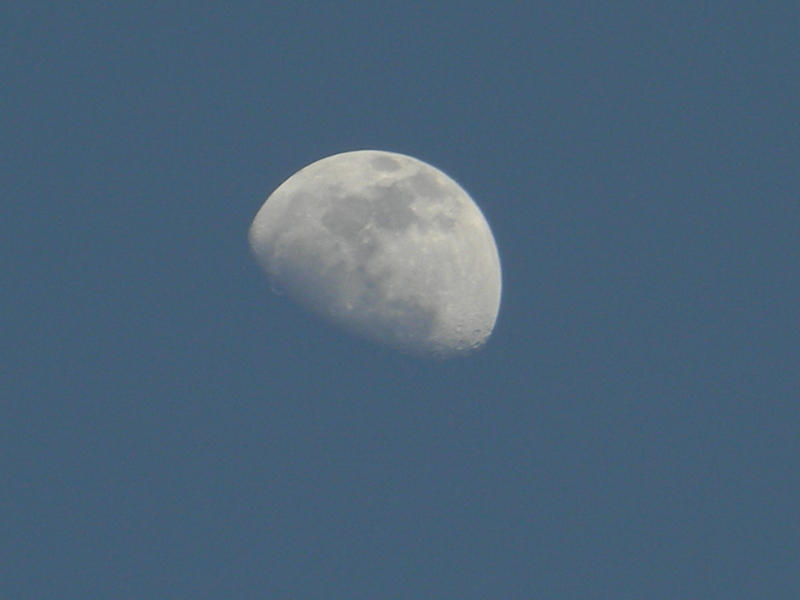 A little fuzzy, but not too bad and no post-processing. Think I may wait on the tripod a little while longer.